Well hasn't the weather been absolutely gorgeous over the past few days. Here at Campbell's HQ I'm sat with the door to the garden wide open and enjoying the fresh air and sunshine. So as the spring sun shines away we thought we would bring you a wedding from last December, how the time is flying!! 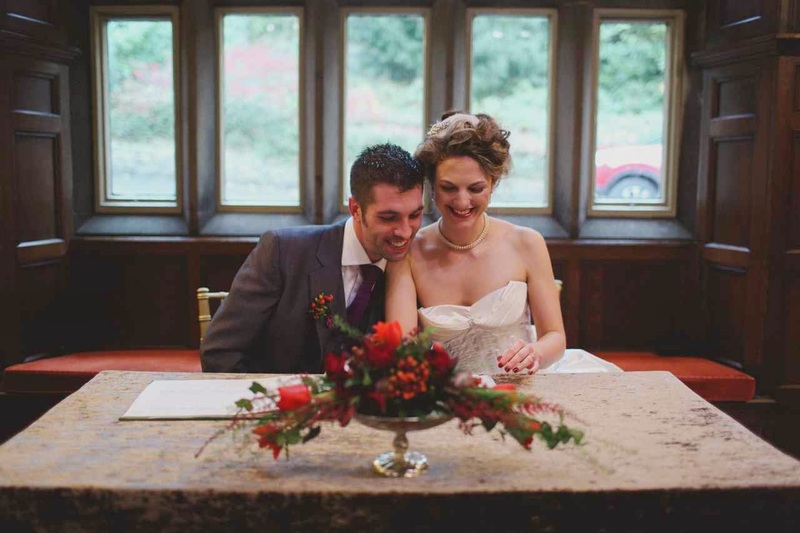 Amy and Ben got married at Whitely Hall which is situated at Grenoside on the outskirts of Sheffield. This beautiful 16th century cottage like building is covered in ivy which as you will see later was reflected in the flowers inside. 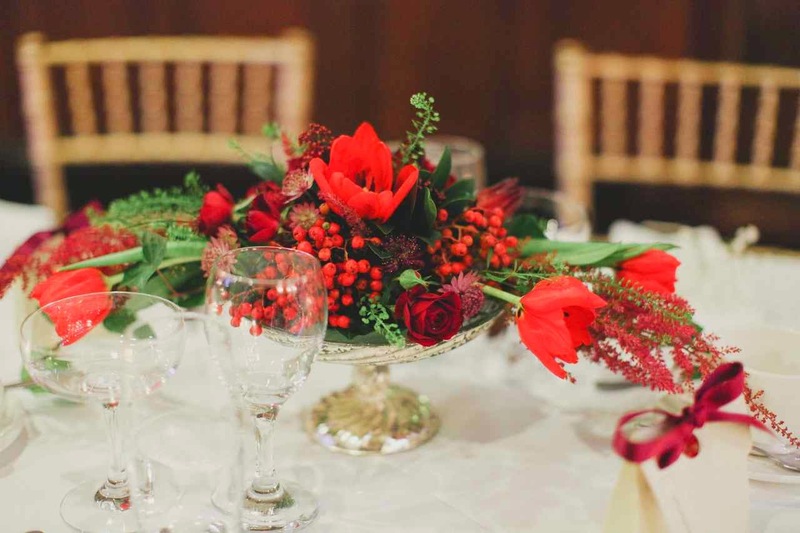 The ceremony room was steeped in character and made the perfect backdrop for a berry red winter wedding. We are sure that flask was for medicinal purposes! We just love this emotional picture of the brides mum drying her eyes, its reactions like this that always bring a lump to our throats. 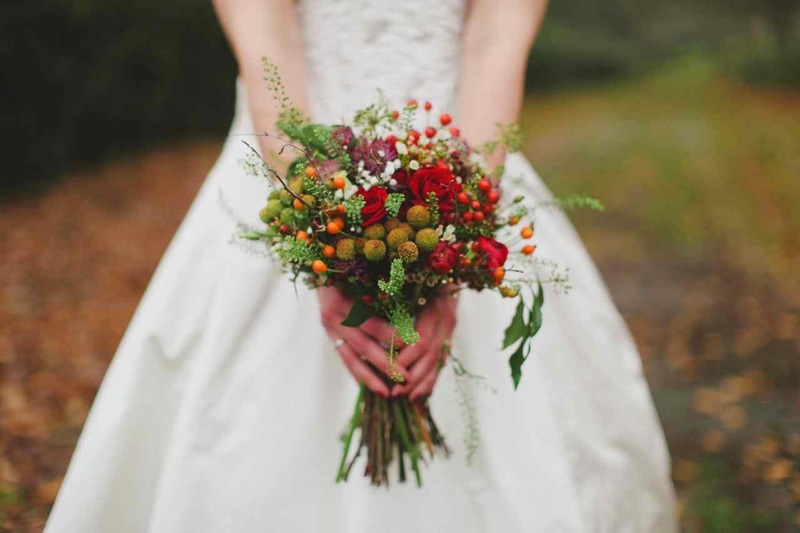 For the brides bouquet Amy chose a wildflower unstructured hand tied in rich berry reds which stood out amazingly against her elegant dress. 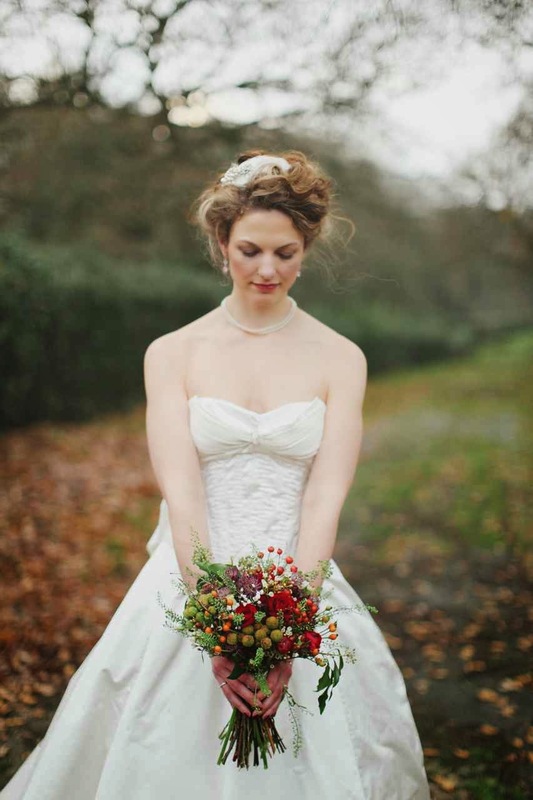 The bouquet included astrantia roma, ‘brown’ hypericum berries, rose hips, ‘Pauline Violet’ ranunculus, red sedum, white gypsophila and tree ivy; all finished with a band of berry red ribbon with a lace overlay. See we told you ivy would feature later on too didn't we?! 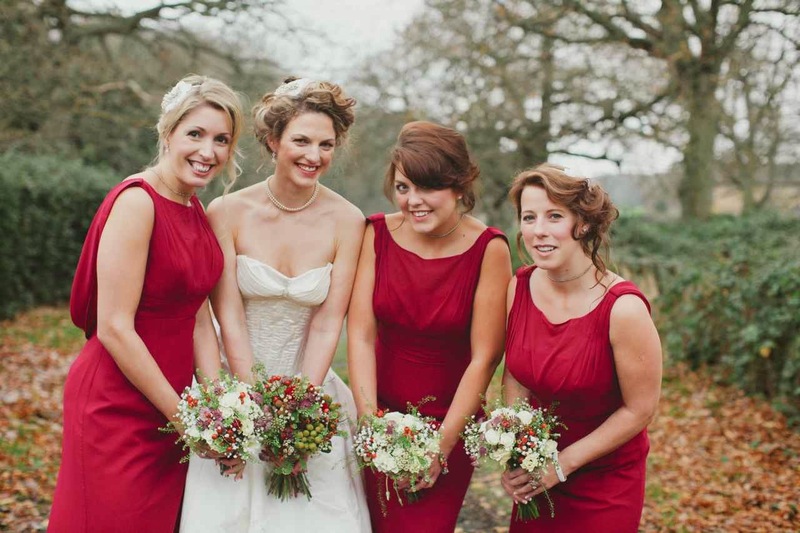 Amy chose to have a similar style bouquet for her bridesmaids but went for more creams so they stood out against the rich berry red dresses. 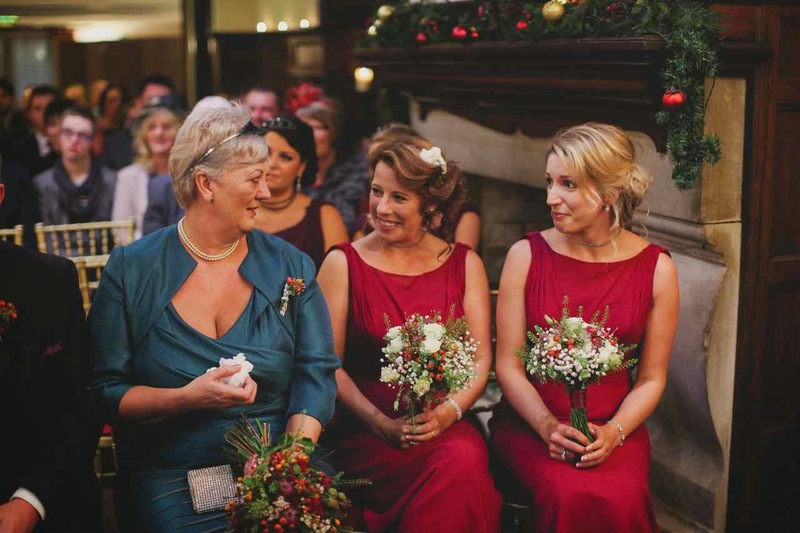 All finished off with a berry red ribbon to match the dresses and tie it all together. As well as bridesmaids Ben & Amy chose to have two best women too at their wedding, well why should the men have all the fun? 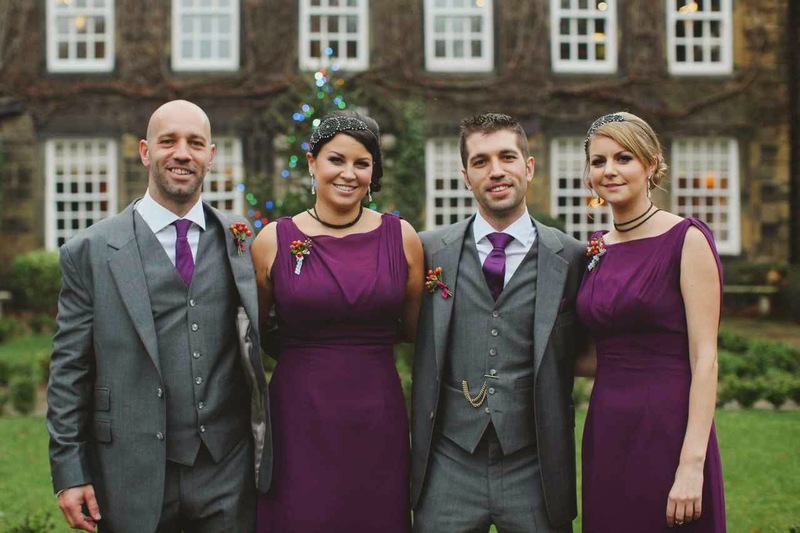 To stand out they wore deep purple dresses but the button holes we made matched the ones wore by the best men so they all looked very smart stood together. We just love working with so many different people and hearing all their different ideas. Fantastic. 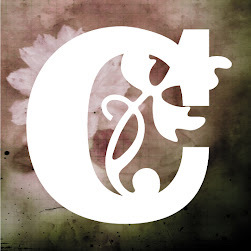 Now lets talk venue flowers. For the top table we used ivy again to create a long vine like arrangement also using flowers from Amy's bouquet so the colours stayed rich throughout and tea lights to give it a really magical look. 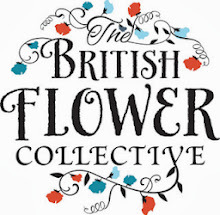 We created a few arrangements in chalices too using the same flowers that were in Amy's bouquet and keeping that wild flower unstructured look. 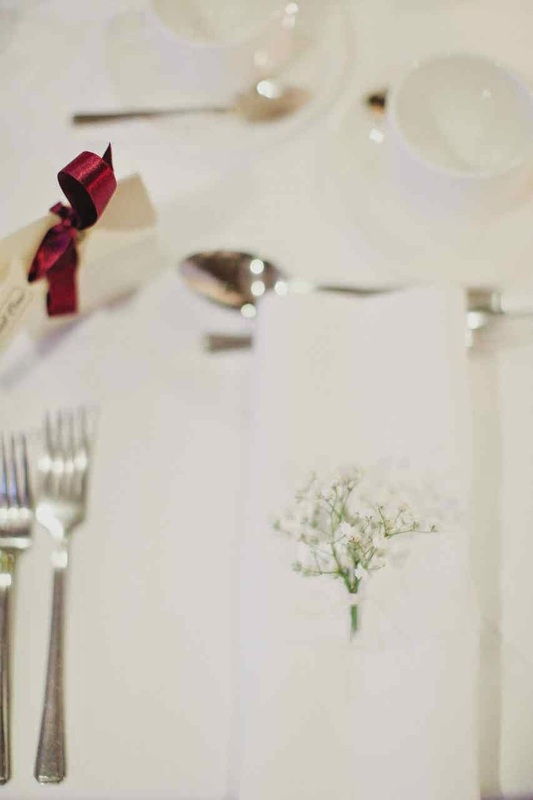 A small bunch of gypsophila was placed on each napkin too, simple but very pretty. 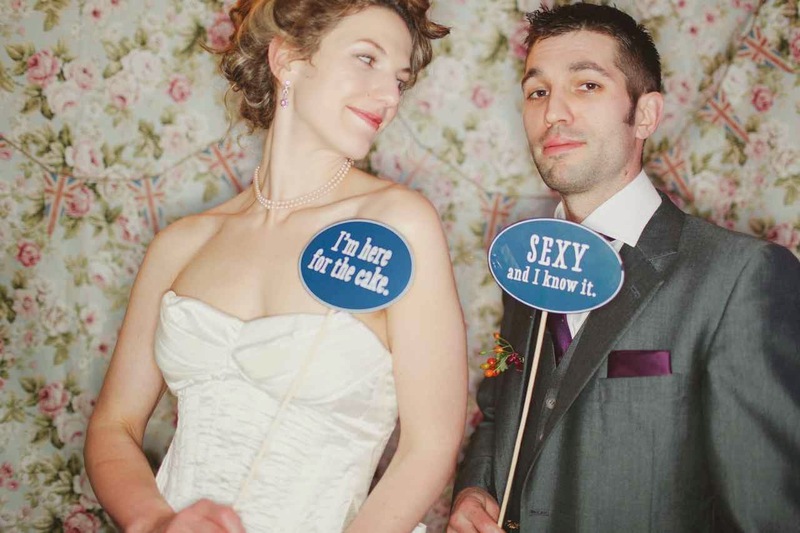 We thought we would end the blog with these last couple photographs of the bride groom enjoying their very special day. Lovely. 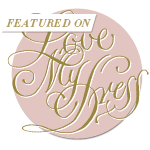 Our thanks to Jess Petrie for her truly gorgeous photographs it's always such a pleasure working with photographers who are generous with their work and love to share just as much as we do! 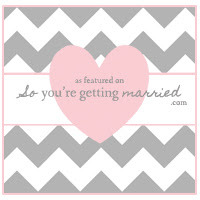 Today we are bringing you a really special wedding which took place only this weekend. 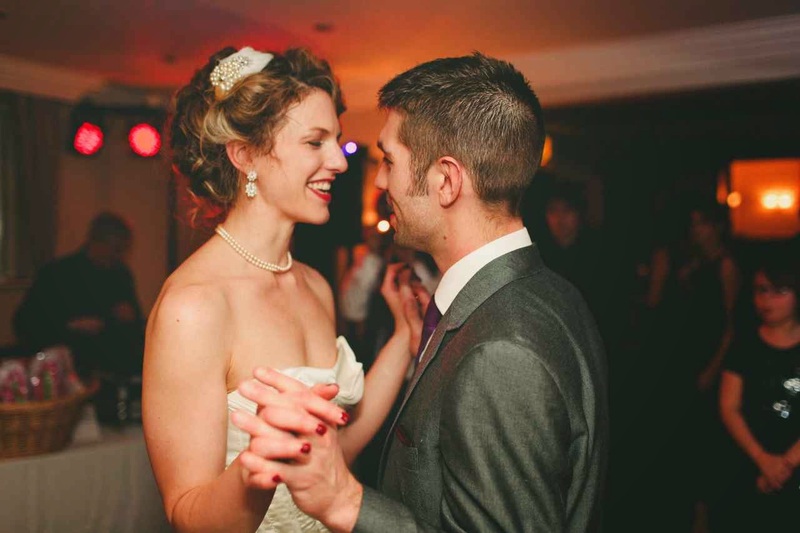 Sarah and Ralph got married at Yeldersley Hall in Ashbourne deep in the Derbyshire countryside. 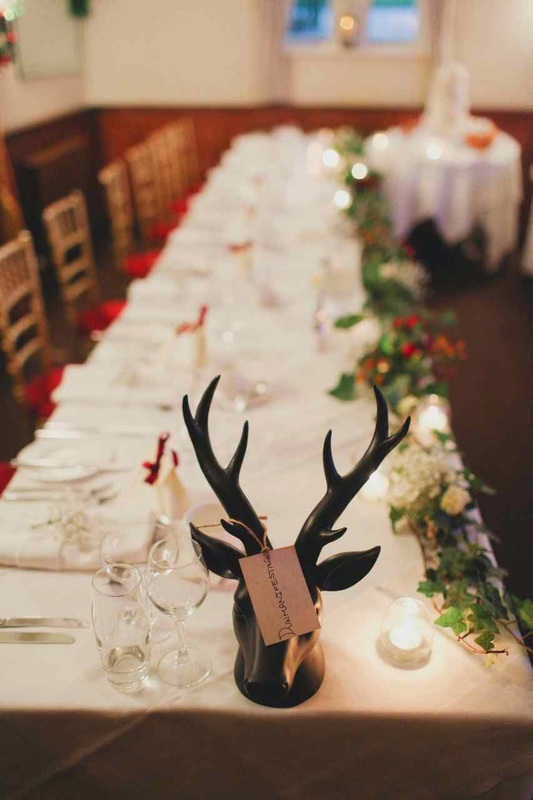 The Hall is surrounded by picturesque gardens making it an ideal location for a real rustic country wedding and the owner and staff there were beyond lovely too! For the bridal bouquet Sarah wanted an informal, unstructured hand tied with creams, peaches and blushes. Among many others the bouquet included green bell, shell pink spray roses and blush ‘Vendella’ roses, 'Peach Avalanche' roses, white double lisianthus, freesia and a little muscari. We delivered the flowers personally and Sarah was beyond happy with them and got a little emotional and overwhelmed when she saw them. 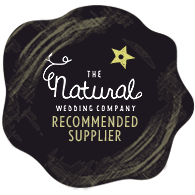 We know it sounds a bit wicked but we know we have done a fantastic job when a bride is overcome with emotion and is one of the many reasons why we love doing what we do. Seeing all of you on your very special day, getting ready, is just such a joy. 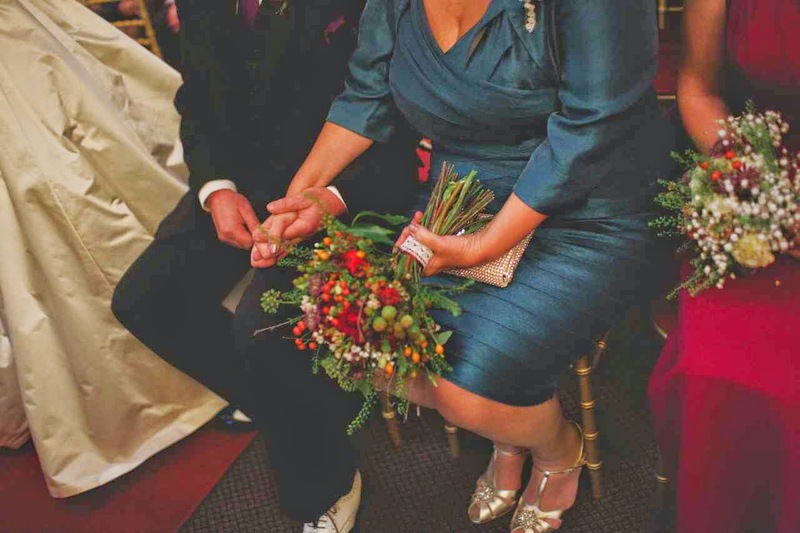 The button holes were designed to look like a small bunch of flowers with Ralph's button hole containing flowers from Sarah's bouquet. Muscari was a firm favourite with the bride and groom so featured in both of their flowers. 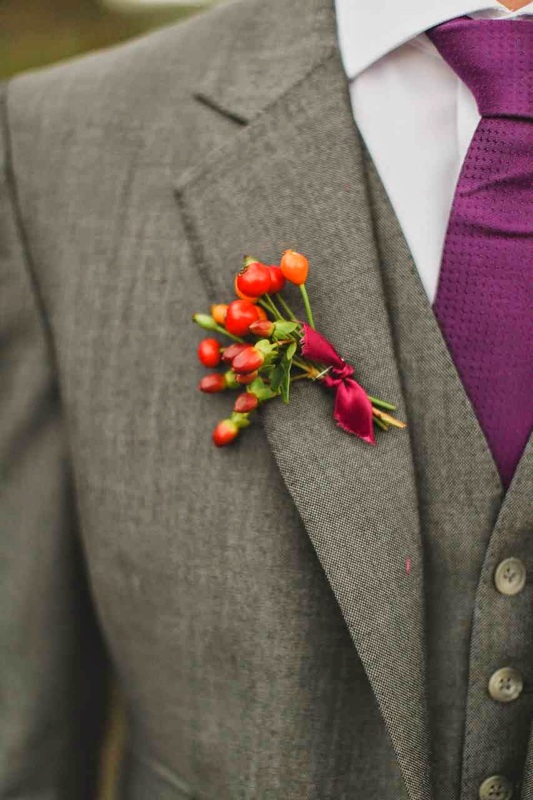 The groomsmen, grandparents and parents buttonholes were even smaller, daintier versions of the grooms button hole including gorgeous shell coloured roses. These are an absolute favourite of mine. The little bridesmaids had wands, I always get excited when T buys wands at the wholesalers. Each one contained a small selection of flowers from the brides bouquet with a peach ribbon to hold it all together. For the table decorations Sarah and Ralph went for cream birdcages for the 'top' table and jam jars again filled with similar flowers to the brides bouquet so the theme ran strong throughout. 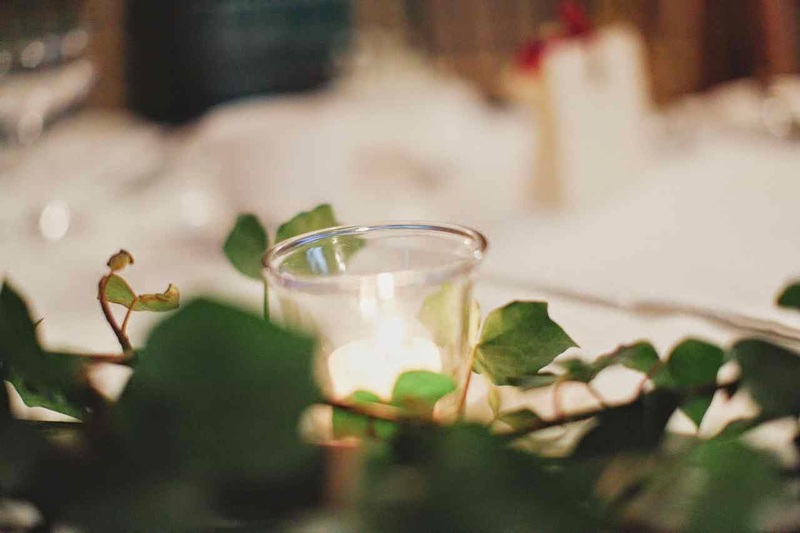 Jam jars containing pretty blooms were also placed on the ceremony table. Simple yet stunning. 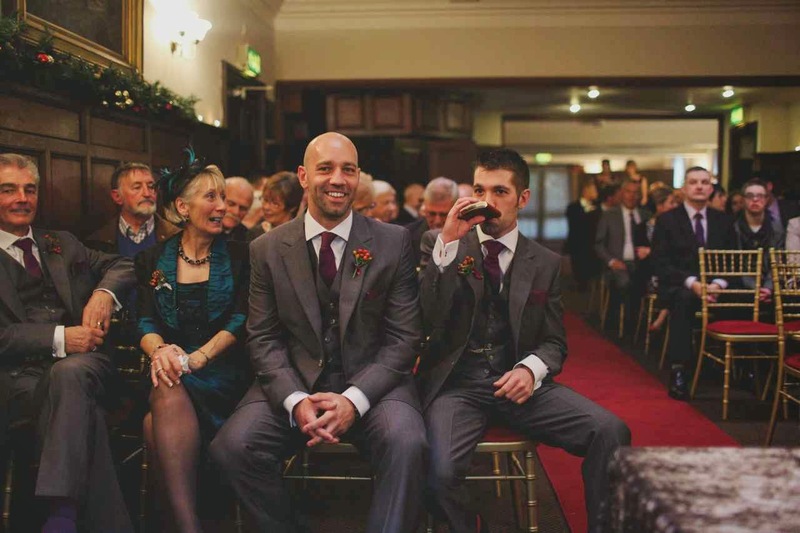 Whilst we were at the venue we couldn't help but notice these beautiful chairs that they had in the ceremony room. Adding lots of character to the venue - we absolutely loved the way they hung the pastel coloured ribbon from the chair backs. Beautiful.